Levi, rear-facing in Britax Marathon. Levi is 1 year, 11 months old and weighs 28 lbs. 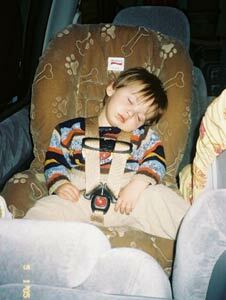 Mom adds: He will remain rear-facing until he outgrows the seat. I am determined to keep him rear-facing longer than my daughter, who "only" rear-faced to 28 months and 31lbs.